Welcome to Class 3A’s page! the artwork of Sean Scully and creating our own tributes to some of his famous paintings. superb setting and character descriptions! Europe in Geography, Vikings and Anglo-Saxons in History and Electricity in Science. Check this page for photo updates of what we have been getting up to! 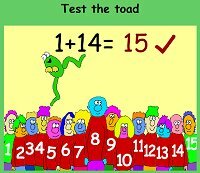 In this game from BBC Schools Numbertime you have to click on the answer to the addition or subtraction sum shown at the top of the screen. You can use the people numberline to count along and help you find the answer. The toad will then hop along to right number.